You can store your smaller parts in the small bins on the doors. The bins on the doors are 4.125 inches wide x 7.375 inches deep x 3 inches high and can hold 10 lbs each. The doors are lockable with a padlock using our 3-point locking system. 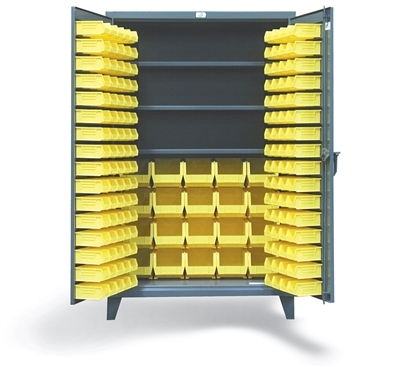 You can store you larger parts in the large bins in the body. The bins on the body measure 8.25 inches wide x 14 3/4 inches deep x 7 inches high and can hold 60 lbs each. There are also 3 adjustable shelves in this model that can hold up to 1,900 lbs per shelf for those larger items like tools and dies.